The Gypsy is made from Japanese cromoly and is designed as a versatile adventure bike that can run 700c or 29er tires (click to enlarge). Andy Holmes has 14 years of experience in the bike industry including a 9 year stint as a Product Manager at Felt Bicycles. For the last 3 years, Holmes has developed his own brand called the Penhale Bicycle Co. leveraging his knowledge of product and brand development along with his connections both here in the States and overseas. As such, Penhale is a small company that specializes in frames that are versatile adventure bikes. Their offerings include a mountain bike frame, a gravel grinder and a touring rig all made from Japanese steel (cromoly or Tange Prestige). 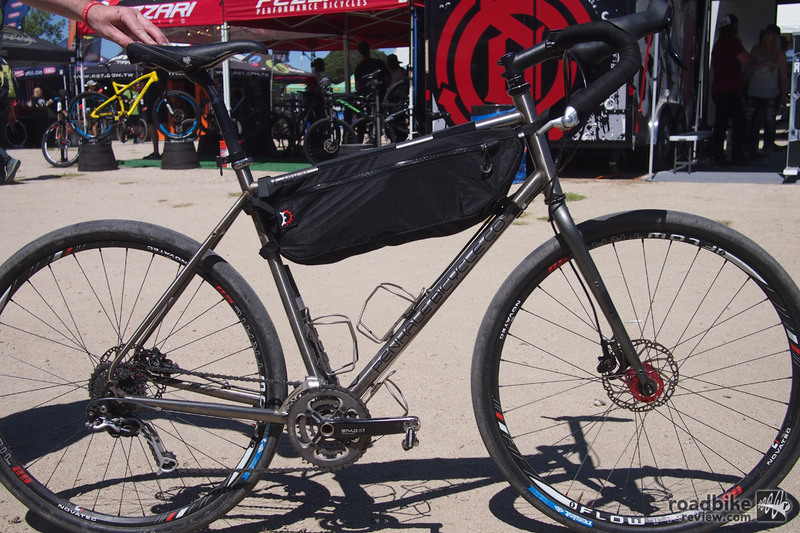 Highlighted here is the Gypsy, a bike that blurs the line between a traditional touring bike and a mountain bike. It can be fitted with 700x45c tires or up to 29×2.0″ MTB tires. The Penhale Bicycle Co. currently only sells framesets that include a matching fork and seatpost clamp. 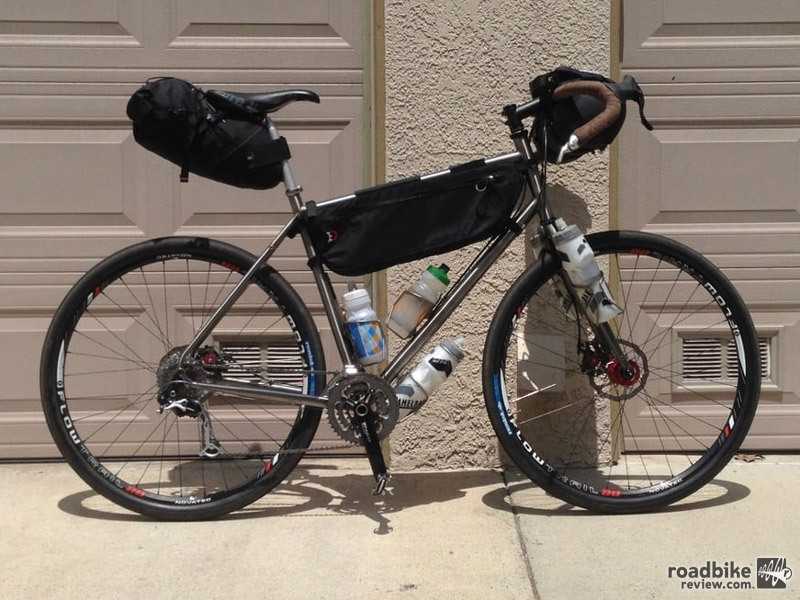 The Gypsy frame is made from custom butted Japanese cromoly and has enough braze-ons to mount racks and fenders and a staggering 5 water bottles (if a front rack is not used)! It is sturdy enough to run fully loaded for a multi-day adventure or it can be packed light and fast for an overnighter. Count ’em! That is a total of five water bottles (click to enlarge). 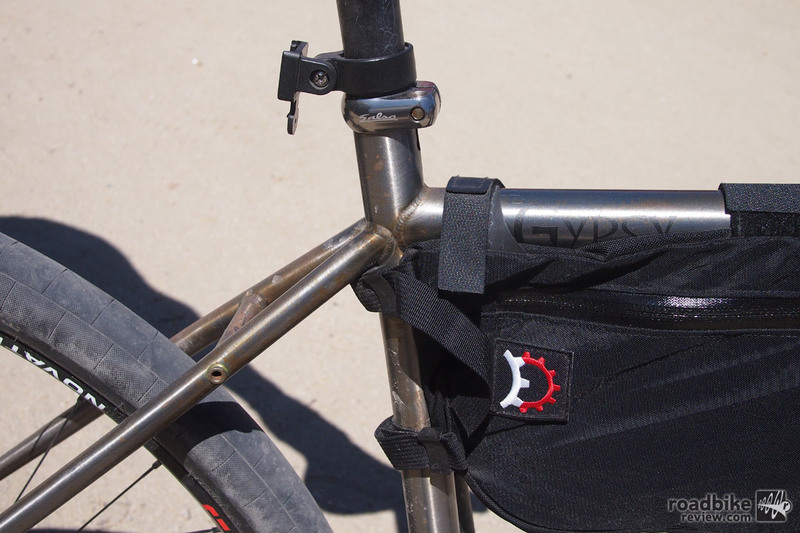 Braze-on mounts on the frame to carry 3 x full size water bottles, rear pannier rack mounts. Fully rustproof ED coated under paint. Frames delivered with fully chased BBs, head tubes and seat tubes. Includes custom 30mm seat collar. Traditional 1 1/8th chromoly head tube, for a standard 1 1/8th headset, machined, relieved and reinforced. 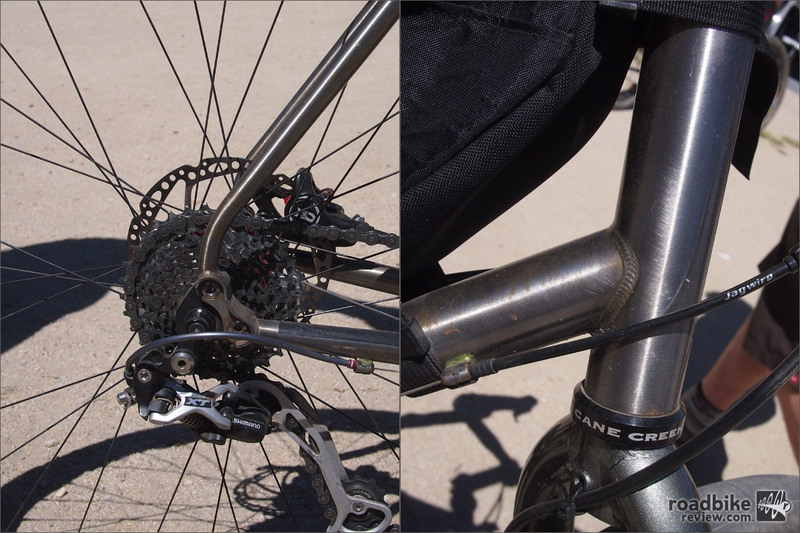 Custom forged dropout design, with “swappable” dropouts to accept either a traditional 135mm for use with widest possible choice of hubs, or swapped to accept any of the newer 142mm x 12mm through axle hubs with the optional dropouts. The forged mount disc brake tab located inside rear triangle for strength and stiffness. This dropout and disc brake mount design is used on all disc equipped Penhale Bicycle Co. models, B’stard, Scruffian, Gypsy and Vagabond. Down tube routing for the rear brake cable/hose guides and traditional cable stops for serviceability and precise shifting. 27.2mm I/D seat tube, for traditional seat post compatibility, 30mm seat collar (included with frame) 28.6mm F/D clamp dia. A close-up of the Penhale Gypsy’s rear end and head tube junction (click to enlarge). The Penhale Gypsy is available in four sizes (SM, MD, LG, XL) and comes in a raw, nickel finish. 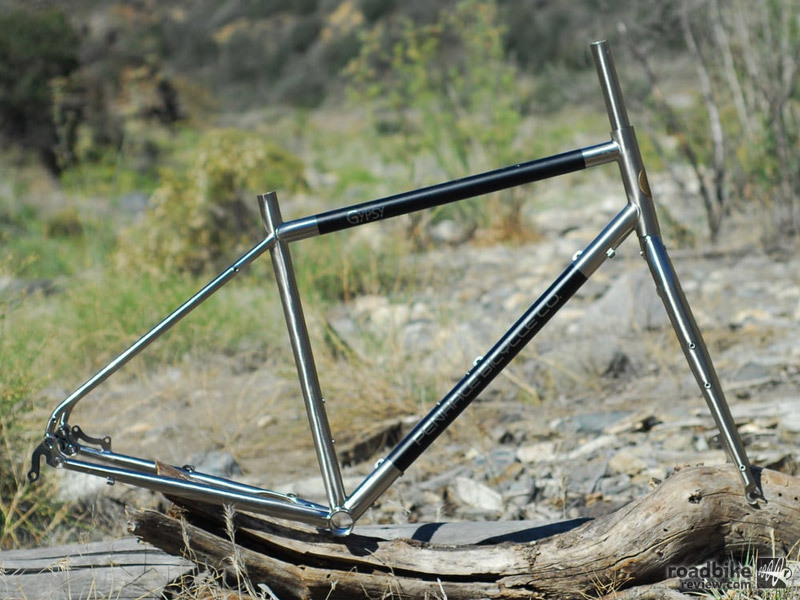 Frames are available now (via the Penhale Bicycle Co. website) and retail price is $599. For more information visit www.penhalebicycleco.com. The Gypsy is made from Japanese cromoly and is designed as a versatile adventure bike that can run 700c or 29er tires. 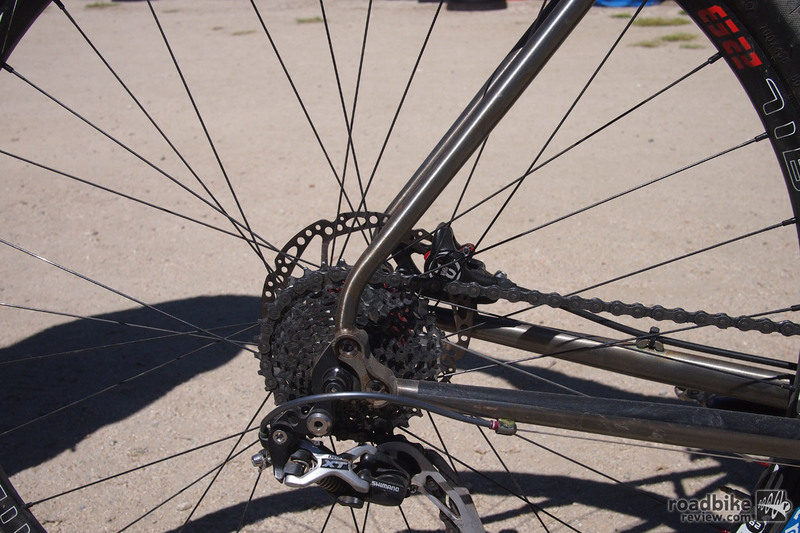 A close-up of the Penhale Gypsy’s rear end and head tube junction. Count ’em! That is a total of five water bottles.